The Logi Package is a service that includes storing and packaging your products, making deliveries and processing returned products. 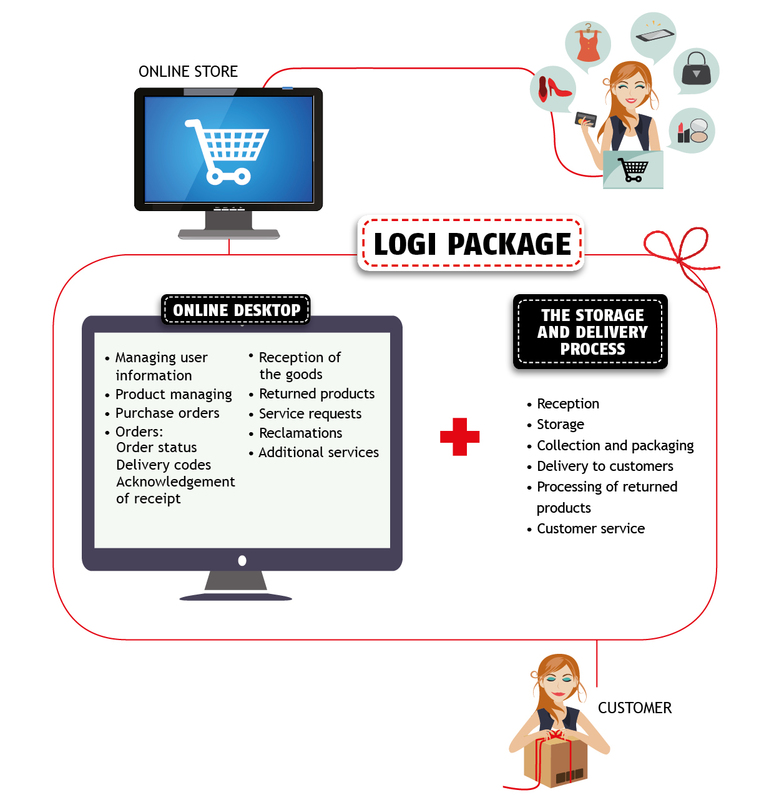 The pricing of the Logi Package service is based on the number of products and parcels arriving and stored at the warehouse and delivered to customers. You can read our customer experience here. The Logi Package Desktop is an easy-to use online connection to our warehouse. The Desktop is used to control warehouse operations and monitor deliveries and products returned by customers. We connect our Desktop to our customer’s online store or order system. The connection enables order-related information to travel fast from one system to the other. If required, the Desktop can also be used as an order system without a connection to another system. For example, sales and marketing staff at our customer Metsä Tissue use the order facility of our Desktop to order materials from our warehouse. Reception is based on purchase orders made on the Desktop. We will inspect the batch and transfer the products to shelves. The amounts will be updated on the Desktop. Products are stored on shelves along the collection route. Information about the items to be collected is sent from the Desktop to the warehouse. The products are collected and packaged according to orders. After this they will be ready for delivery. The service includes delivery notes and standard delivery bags and boxes. 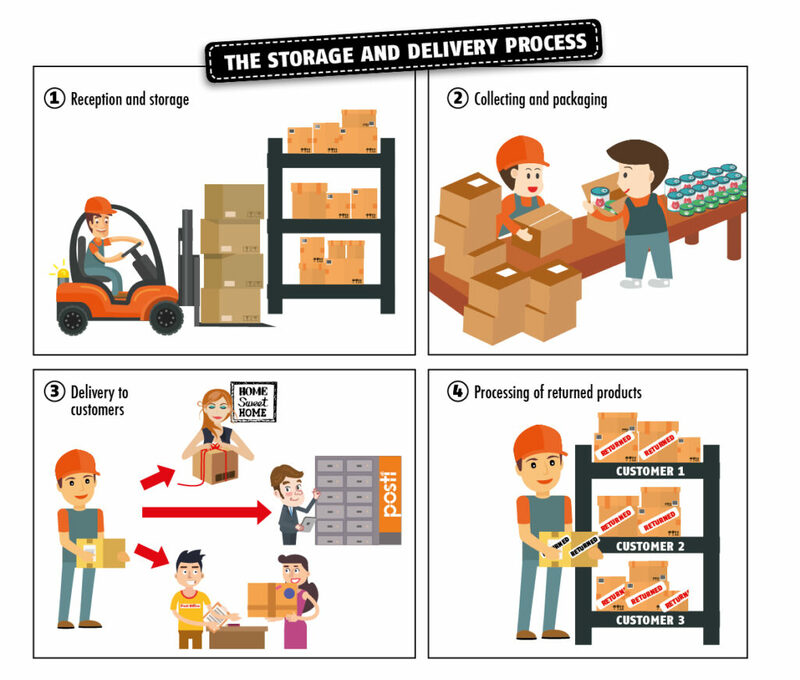 The products are delivered according to the delivery method and time selected at the time of ordering. They are delivered to the customer’s home or office, or a pick-up point selected by the customer. Our service includes sending an SMS message to the customer with a delivery code, and the delivery of the parcel. Information about the delivery code and acknowledgment of receipt is sent to the Desktop. We register the returned products as soon as they arrive. We inspect the products and put saleable products back on the shelves ready for sales. Information about returned products is sent from the Desktop to our customer’s system. You can contact our customer service on weekdays from 8:00 to 16:00 by phone or email, or by sending a service request using the Desktop.